Jimmy Anderson raises the ball to the crowd after taking a five-for against India in the second Test at Lord's (Picture: Adam Davy/PA Wire). JIMMY Anderson admits he would have been furious if he had let India off the hook in perfect conditions after helping to bowl them out for 107 at Lord’s. His 5-20 took him to the verge of yet more cricket history, just one more victim short of becoming the first to bank 100 Test wickets at the sport’s most famous venue. After leading the way as India were bundled out in just 35.2 overs, Anderson said: “Honestly, I’d have been so disappointed if I’d messed up because they were the ideal conditions to bowl in. “I find it so much fun when it’s like that. Asked if it also proves he and his fellow seamers are the masters of India’s batting line-up on home soil, the 36-year-old pointed out that anyone would have struggled against England’s attack on this showing. “I think that if we bowled like that, with those conditions, we’d bowl most teams in the world out because I think we were that good,” he said. “We hardly bowled any bad balls, didn’t give them much to hit at all and when you build pressure like that all day, no matter who you are around the world, it is difficult. “I think if we were bowling at our (own) batsmen we’d have the better of them (too). “We exploit those conditions as well as anyone in the world. “We’ve got the responsibility to set the tone for the team, and bowl well. That’s our job,” he said. “Some days it hoops round –they’ve been quite rare actually, the days we’ve had like that, move through the air as much as that. Virat Kohli’s wicket evaded Anderson, and instead fell during an outstanding spell from Chris Woakes. 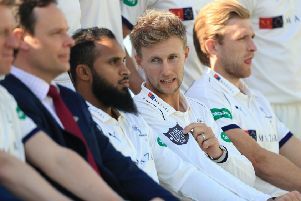 England’s all-time leading wicket-taker had his share of moral successes against the India captain, though, and Anderson said: “I was thinking, ‘Why can’t he edge them like everyone else?’. “I’ve really enjoyed the contest between myself and him. He’s No 1 in the world for a reason. “I love playing against the best players in the world, testing yourself and seeing whether you can get the better of them. “It’s a really thrilling thing to be a part of. “When you play at the highest level, no excuses,” said Rahane.